After learning how to build walls, frame floors, and ceilings gable roof framing is the next logical step in learning the carpentry trade. Some roofs are so complicated they tax the knowledge and patience of even the most experienced roof cutters. A simple straight gable roof however is not one of those roofs. If you are able to read a book of rafter tables , draw a right triangle, use a framing square or speed square, and use a circular saw then you can frame a gable roof. After you have mastered a simple gable roof you can then move on to more complicated roofs. The basic parts are a ridge board, gable studs, and common rafters. A gable roof slopes downward in two directions, like two right triangles joined together at the vertical line of the triangle. The ridge board runs along the peak of the roof parallel to the outside walls. The top of the common rafters are nailed to the ridge board and slope downwards to the outside walls where they are nailed to the ceiling joists and the outside walls. All of the common rafters are the same size and length for each span and roof pitch. Gable roof framing is like learning to drive, you don't need to know how the mechanics of the vehicle work, but you will be a better driver if you do. You don't need to be an expert on the Pythagorean Theorem to be a good roof cutter but the better you understand it the better roof framer you will become. Before gable roof framing begins the walls should be plumbed, lined, braced, sheathed, and the ceiling joists nailed in their proper locations. After all of this is done you will need to construct a sturdy platform from which to work. I usually use roof sheathing laid flat on top of the ceiling joists. After the roof is framed the sheathing can then be handed up to be placed on top of the rafters. If the roof pitch is steep or the span of the rafters large you will need to construct some sort of scaffolding in order to nail the tops of the common rafters. Build this scaffolding in the center of the span and at a height that will leave your shoulder four to six inches below the bottom of the ridge board. This scaffold height will make it easier to set the ridge board and maneuver when filling in the common rafters. After the rafter length has been determined and a rafter pattern made two more common rafters should be cut and tested for fit using a wooden block to temporarily represent the ridge board. 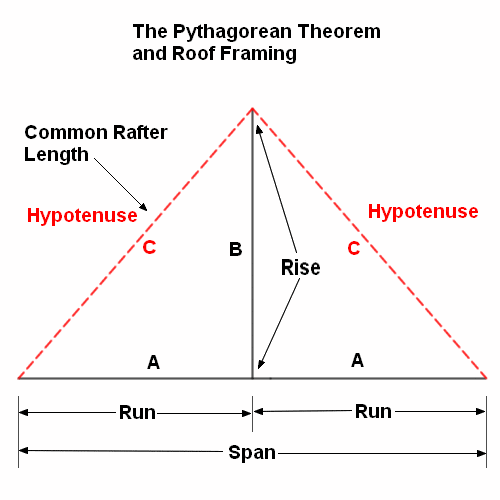 The less experience you have at cutting roofs the more important testing the length of the common rafters becomes. You will probably be forgiven for cutting a couple of rafters wrong, but the whole roof load is a different story. The ridge board should be one size bigger than the common rafters to achieve full bearing, 2 x 4 rafters = 2 x 6 ridge board etc. Always use nice straight lumber for the ridge board this will make installing the rafters easier and also make for a straighter ridge line. To make it easier on the carpenters framing the roof the ridge board should be laid out before being handed up. When framing houses any work that can be performed with your feet flat on the ground should be done, it is far more efficient, safer, and accurate that way. Before laying out the ridge board make sure it is square on both ends. Mark out the gable end overhang and rip the ridge board down to slightly less than the width of the fascia so it won't interfere with the soffit when it is applied. The gable end rafter should be laid out on the inside of the end wall so the gable studs can be nailed to it without notching the studs to fit. Lay out the rest of the rafters to mirror the lay out of the ceiling joists so the rafters can be nailed along the side. If the building is longer than one section of ridge board you will need to splice another on the end. I usually use a 14 1/2" block or piece of OSB, take care not to nail it on where a rafter will go. It must also be held down from the top of the ridge so as not to stick up above the rafters. I recommend at least three carpenters to set the ridge board, two in the center and one to work the outside walls. The gable roof framing technique I will describe here uses the common rafters to set the ridge board in position eliminating the need for temporary props and a lot of guess work. Start one rafter in from the gable wall with one man in the center and one on the outside wall. Pull up a rafter one layout mark in from the gable end and hand it up to the man in the center. Hold the top of the rafter near where it will go and with the backside of the bird's mouth tight to the outside wall nail it down to the double top plate. Don't nail the rafter to the ceiling joist yet. Move to the other side and do the same thing with the opposing rafter. Once the bottom of the opposing rafters are nailed to the top plate they will rest against each other and support themselves. Leave one carpenter there to balance them, especially if it is windy. Move down to one rafter in from the end of the ridge board and repeat the process. Now slide the ridge board in between the two sets of rafters from underneath and nail the rafters on the correct layout marks. It is often easier to toenail an eight penny nail in the top of the rafter to hold it in place until sixteen penny nails can be put in place. To square up the ridge board with the ceiling joists, have one carpenter steady the ridge at its approximate position. Measure, cut, and install the center gable stud between the top of the gable wall and the bottom of the ridge board. Plumb up the gable stud and nail on a brace to hold the ridge square, take care not to place it where a rafter will eventually go. After the ridge has been braced you can now spike the four rafters to the ceiling joists. Below is a graphic of gable roof framing with the center gable stud nailed in place. After the first ridge board has been set and braced in place continue setting the remaining ridge until the other end of the building is reached. With the splice block you can just nail the end of the second ridge to the first and slide the other end up between two common rafters to set the height. Once the other end of the building is reached you will need to cut the far end of the ridge to match the overhang. After all of the ridge board is up you can fill in the rest of the common rafters. To keep the ridge board straight you should put two rafters on one side and then two on the opposing side, nailing them to the top plate, ceiling joists, and ridge as you go.